We have seen in the earlier Article how to change Paper Size and Page Orientation of MS-Access Reports automatically through program for any Printer on the Network. We have copied PrtDevMode Property Values into Memory; modified them to match the Paper Size and Page Orientation of the Report and updated them back into the Report Page Settings before printing it on the default Printer installed on the User's Machine. We are going to perform a similar exercise to change the Margin Settings of MS-Access Report through program. This time we have to work with PrtMip Property of the Report to change the Margin Values. Copy the PrtMip Property Values of the Report into a 28 Bytes long String Variable and move it into a redefined structured data area for modification. Change the required Margin Values in Memory. Update them back into the Report's PrtMip Property. Save the Report with the changes and open it in Print Preview. Open one of your Databases with Reports in it. Display the Visual Basic Editing Window (Alt+Fll). Insert (Insert - - > Module) a new Standard Module (Global Module). Copy and paste the following Code into the new Module and save it. Open one of your existing Reports in Design View. Select File - ->Page Setup - - > Margins. Change all four sides (Left, Right, Top and Bottom) of the Margin settings to 1 Inch. Open the Main Switchboard Form of your Application or create a new Form. Create a new Command Button on the Form. While the Command Button is in selected state, display the Property Sheet (View - - >Properties). Change the Name Property Value to cmdPreview and change the Caption Property Value to Print Preview. Copy and paste the following lines into the Code Module of the Form. Replace the name MyReport with your own Report Name. 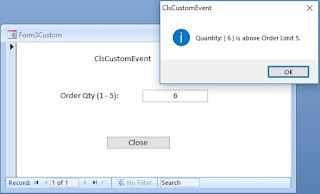 Open the Form in normal view and Click on the Command Button to run the Program and change all four margins of the Report to new values and to open the Report in Print Preview. Close the Report and open it again in Design View and check whether the margin settings have been really changed through program or not. Note:If any value is less than the allowable range, based on the printer driver settings, the printer may fix it to the allowable range automatically. In that case you may find some value is greater than what you have specified. You can do a sample run of the Program by typing SetMargins "YourReportName" in the Debug Window directly, without the use of Form or Command Button. You can run this Program from within the earlier PaperAndOrient() Program to change the Margins also along with the Paper Size and Page Orientation. All the three set of values can be changed by calling the PaperAndOrient() Program alone. The Dimensions of the Reports, Forms and other Objects are measured internally in Twips rather than in Inches or Millimeters. We are allowed to change the measurements on the Property Sheets of Report, Form or other Objects in standard measurements manually, like Inches or Centimeters or in any other regional values. They are automatically converted into Twips internally. But, in programs we have to do that work before changing the values of the Property of objects. We have used Constant values in the Program for Page Size, Orientation and Margins for simplicity. You can modify the Code to pass these values as parameters along with the Report Name, when the Program is called for each Report. This will give more flexibility and the Program can be called for Reports with different Page Settings. Next we will see how to change the values on the Columns Tab of the Page Setup Dialog Box of File Menu.